The Fyxation Gates Toe Straps are a high security, wear and tear resistant alternative to traditional toe clips. 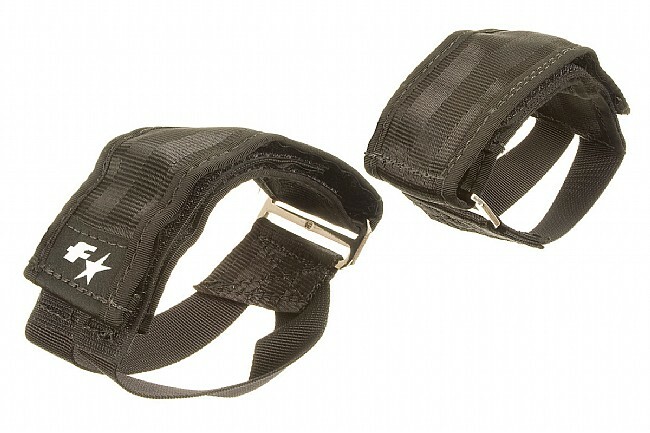 Built for use with the BMX-style pedals like Fyxation's very own Gates model, these durable holders are made from 2 inch nylon seatbelt webbing. A stiff lower strap maintains the shape so they're easy to get in and out of, and the extra long upper strap adjusts to accommodate footwear of all shapes and sizes. The Gates Toe Straps are available in Black and White and are sold in pairs. Made in the U.S.A. I use these with fixation pedals to cruise without SPD. They are really functional and relatively easy to get into, but the foot is much farther forward than an spd or even toe clip (which i despise), but i'm still getting used to them. They are stiff enough to stay open for entry and locking up the rear tire feels solid, but takes some getting used to as well. i feel like i have yet to get them fully dialed and different shoes require different adjustment, but this is simple. I am an SPD guy though so to me nothing compares to that connection and foot placement.